*This story originally appeared in the January 2018 edition of On the Water Magazine. Man, I hope something happens during this fishing trip that makes the sleep deprivation worth it. The thing is, it doesn’t even have to be a fish. I could get skunked, go the day without a bump, and be totally content as long as something memorable happens during the trip. Maybe it’s a blood orange sunrise over a clouded peninsula, or a four minute springtime squall that crashes through and leaves the silence of slightly diluted saltwater in its wake, or a family of ospreys watching curiously as I paddle by. But my (usually unrealized) fear is that I’ll get out into that quiet ocean air and nothing interesting will happen. It was high tide on the Flats in May. The striper season had yet to materialize in the way we picture when we daydream about May during the offseason. Fishing reports had been quiet, the loud voices in the community blamed diminished stocks and climate change. The spring migration seemed to be coming in a whimper, rather than a bang. I had a few hours before all the water moved out of the channels and cuts of the sandbar into Cape Cod Bay. I paddled my kayak out of a relatively calm creek and was met with the roar and chop of a hard Southwest wind. Not the most ideal paddling conditions. I positioned the kayak with the stern facing the waves, so as to minimize the possibility of a rogue broadside hit, and was able to maintain a relatively safe and stable position in the wide, twelve-foot craft. But in the following seas, I found myself tightening my PDF a few notches just to be safe, before paddling toward some of the promising locations I had scouted a few days prior. I drifted a few hundred yards east when I spotted a group of birds diving in the deeper water just off a bar. I rode the waves, doubling my paddling speed, trying to reach the blitz before it dissipated. Luckily, I did, and I was able to cast under diving terns three or four times before resetting my drift. I watched a bass blow up a school of baitfish, and a tail bat the water. I cast into the fray. Splash, pause, reel, reel, SET, fish on. The fish pulled some drag before I was able to subdue it and get it to the side of the kayak. I suddenly didn’t mind the weather. It was hell to try to maintain position with the wind and current moving in the same direction, but the sound of a singing drag can usually make everything better. Just then, I noticed a few fly fishermen in wetsuits traversing a deep, fast moving channel running through the now shallow flat, attempting to put themselves into position to cast to the surface feeding stripers. I continued paddling and casting and chasing around the birds, half-paying attention to the group of four as they swam one by one across the rip, nine-foot fly rods sticking out of the water like periscopes. Two other kayakers paddled with me at the edge of the rip line, and we briefly stopped to chat about the fishing, the weather and how strong the current was that day. When I looked again toward the shore, three of the wet-suited anglers had made it safely across the rip to the other side of the flat, where they stood, laying out long false casts into the wind. The fourth was still in the channel, slowly paddling with one shoulder out of the water, the other arm doggy paddling underneath. From my vantage point, I couldn’t tell if he was making any headway. But then, I heard it over the din of wind and waves. I paused, listened. Did I really just hear that? Without thinking, I pivoted and paddled my lumbering kayak toward the wet-suited head. I watched the shoreline to my right and realized I was only holding in the current. A tackle bag came slowly to my portside and I reached in and pulled it out of the water. The fisherman followed along behind his bag at an alarming rate of speed. So I did what I was told and pointed the kayak toward the shoreline on the other side of the channel, where the rest of his group had swum. I put my head down and dug the blade of my paddle deeper into the water while my passenger kicked. The three other fly fishermen stood on the now exposed flat watching us eagerly, aware of the danger their friend had suddenly found himself in. After a few minutes of hard paddling, I looked up to see what type of headway we had made. The shoreline hadn’t moved and we were no closer to the other side of the sandbar than when we’d started. We’d barely maintained our position. What was at first a nervous shot of excited adrenaline had shifted to a persistent dread-filled pit in my stomach. Saltwater spray splashed up into the deck of my kayak as we were pushed out deeper, where the standing waves had grown. “Have we made any progress?” he asked, out of breath from kicking. I turned the kayak and we began moving in the opposite direction. Although we were now traveling against the wind, we began making headway. White water pushed off the side of my kayak. Our demeanor lightened a little despite my burning shoulder muscles. After what seemed like an hour of hard paddling, my fishfinder read four feet and I could see the seashells and patches of eelgrass on the sandy bottom pushing slowly behind us with every paddle stroke. He touched down on the sand and used my kayak as a flotation guide. Slowly, he trudged against the current, every swell of surf threatening to sweep him off into the blue water again. It finally shallowed enough where I could jump out and pull the kayak with him. We dragged my kayak up onto the exposed flat. With feet firmly planted on dry ground, exhausted, trying to catch my breath, I fell back and sat on the sand. “Your fly rod. Did you lose it?” I asked. “Yeah, I ditched it in the channel. My Mom gave it to me ten years ago.” He trailed off and looked out toward the rip. We shook hands and he introduced himself. His name was David, from New York. He and his three friends, fly fishing fanatics from different parts of the country (and one from across the pond), make the pilgrimage to the Cape a few times a year to chase stripers on the fly. Realizing that we weren’t going to make it to the far side of the bar, the rest of David’s group had traversed the channel again. They walked over to us, and with a mix of sincerity, playfulness and good, honest ball-busting, patted David on the back, commended his swimming skills, and thanked me profusely. After chatting with the group for a while, I decided to make a few casts into the cut. David’s group had moved up towards the end of the sandbar where the current churned into whitewater, but the water looked plenty deep in front of me and the tide was still moving at a good clip out, with around an hour to go until slack. The sky had cleared and the wind had stated to subside, and it was freeing to be able to focus on fishing again rather than pulling someone from the tow of a rip line. I cast a Bill Hurley Sand Eel into the rip and twitched it once, letting it fall in the water column and swing in the hard current. The flat had started to fill up; families collecting seashells, fishermen casting plugs and flies, children chasing each other in circles. And I started to get the beauty of it all at once; brilliant blue water, miles of rolling dry sand, the endless Cape Cod sky. I took a turn of the reel handle and felt the tell-tale tap tap of a fish, although nothing like the feel of the smaller fish I had caught earlier. I pulled back and set the hook. The drag screamed and the rod bent, and line shot out from my 4000-sized reel. Before I could say anything, I saw monofilament peeking through the braid. Backing. Oh no. With visions of a bare, line-less spool in my head, I tightened the drag three clicks and leaned back on the rod. I heard the clink of a high E string tuned up three steps as the braid to mono connection clicked through the guides. I whispered prayers to the fishing gods that all of my knots would hold, that all of my guides were nick free, that the big fish wouldn’t find something below the rip to break me off on. I began to work back line, but the fish made another long run and put me on the backing again. Amazingly, the fish was still pulling line, using the outgoing flow in the cut to its advantage. I leaned back on the rod and took a few more turns of the handle. I started to gain back line and felt the fish turn. The knot joining my backing and main-line braid clinked back through the guides and wound safely onto the spool. I saw a splash on the surface out past the two bars. “Nice! Looks big,” David said from up on the bar. “Does it feel big?” I couldn’t answer, didn’t want to utter anything that would jinx my chances of landing my first big fish of the year. “Looks big,” he said again. The battle slowed and the fish meandered toward me. I thought about how ridiculous it would have been if I lost her right there, and was immediately certain I would do just that. But slowly, our distance closed and I was able to hand my rod off, reach into the water and put my shaking hand inside her mouth. She was light in color, almost tan over pale white and olive flanks, seven solid stripes running parallel across her body, reflecting and multiplying in the shallow water. Her gill plates opened and closed, all of her energy spent. Her tail swayed with the current. I walked the fish into deeper water and revived her, letting the current flow through her gills. Her dorsal fin shot up and she made another big kick with her broom tail and disappeared into the deep cut, following the outgoing current, to either continue her migration North, or spend the summer in some corner of Cape Cod Bay. “Karma is a wild thing,” David said, staring out into the water where the fish was released. I agreed. The tide on the flat changed and began to rise, and the sandbars finally began their dance into the sea. The fishermen casting on the bar slowly drifted back to the shoreline, either back home or to a different fishing location or to their trucks to wait out the tide. The terns took flight and called to the flock and flew Northeast along the beach. David and I planned to fish together some day and I lost sight of his group as they walked down the beach toward the parking lot. The first big fish of the year always feels special. 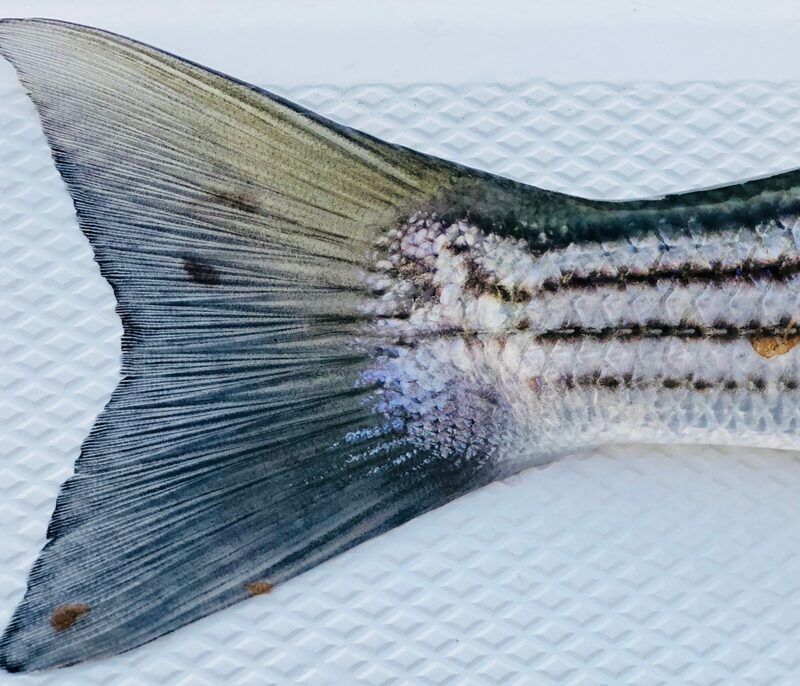 The start of the striper season brings an invigorated perspective, immersing us in the energy of a bay shimmering with life, colliding us with others who share the same fanaticism of the sea and the pursuit of striped bass. In the winter, we cross the lengthening days off calendars, holding onto the distant promise that the stripers would be here soon and we’d find ourselves fishing on some May morning on a flat and actually have a shot at catching one. But of course, it’s never just about the fish. It’s the people and nature that surround us; the humbling danger of a ripping current and a quickly receding shoreline, a tropical Cape Cod sky emerging from the darkness of a stormy morning. Every day spent fishing is an absolution, a tiny fragment in a kaleidoscope of other larger, blurred moments.